1 You can access the WimAsAService Web interface through a usual Browser like Edge, Internet Explorer, Chrome or Firefox. 2 On the Web interface create a new Image Type. 3 Before the Image can be created it has to be configured. First of all, give it a Name. 4 Choose one of the Images, which is available in our Image Repository. 5 Specific configuration can be applied to the chosen Operation System. Self-Created PPKG Files can be uploaded, Modern Apps can be uninstalled, Windows Features can be activated or deactivated, even undesired Windows Updates can be excluded. There are applications placed at the disposal by baseVISION AG, or you can upload your own Applications. Insert the language packages you want into your WIM (Multiple can be added). PowerShell scripts can also be implemented into the WIM file. If you have some special desires during the WIM creation your PowerShell scripts can be added to the Task sequence steps “Before Apps, After Apps and Before Sysprep”. Last of all you can define a schedule for automatic WIM creation. When you’re done save your Image Type. 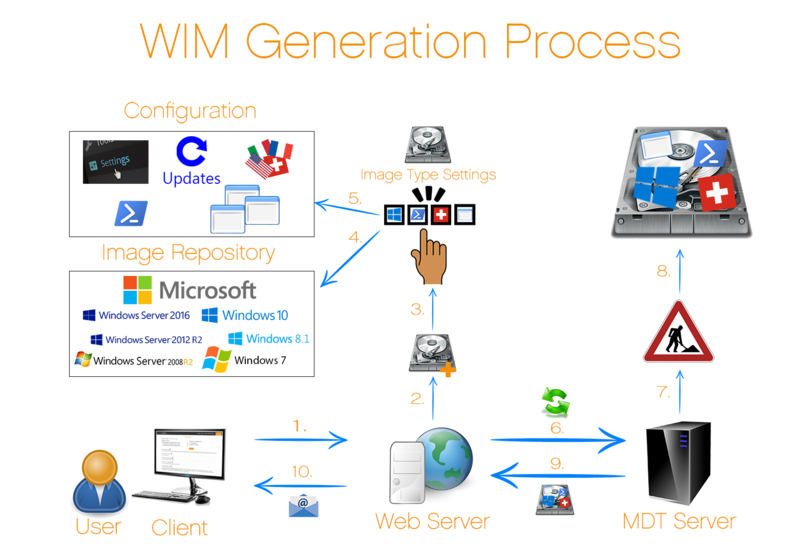 6 If you press the Button “Generate Wim” all essential Information will be prepared for the MDT Server. If the MDT Server is busy, the Task will be queued or otherwise it will start immediately. You will be informed with an E-Mail when your creation process has been started or queued. 7 The MDT Server starts the creation process. The default Task Sequence is adjusted based on your configuration. With aid of a Virtual Machine your deployment process will be started. 8 The WIM file will be finished with the configuration you set. 9 At the End of the deployment Process your Image will be available through the Webinterface. 10 If everything is done you receive an E-Mail. In there is stated, that the WIM File is ready to download. You can trigger any kind of Application Installation, as long that it can be executed silently. If you want to add an Application, you first need to create a ZIP File that contains the Application Files. The File you want to execute needs to be in the Root Folder of your ZIP File. Language = The Language of the Application. Select ML if the Application can be used in more than one Language. Command Line = The Command Line Parameters required to install the Application silently and without User interaction. msiexec /i Microsoft-CMTrace-5.0.7782.1000.msi /qn REBOOT=ReallySuppress /L*V "C:\Windows\Logs\Microsoft-CMTrace-5.0.7782.1000.log"
When entering the Feature Names this must be done with case sensitivity. This page was last modified on 13 March 2019, at 15:15.